I've been using all kinds of external Firewire hard disks for editing with FCP systems. Since 2003. LaCie, Maxtor, Western Digital, Seagate. But Firewire. Not USB. USB has ben believed to be unsuitable for film editing work because of the continuous throughput that editing demands can't be supplied by USB. I thought so as well. Editing on the go with laptops - has been possible for some years now. But the older G4 PowerBooks were underpowered for anything but the shortest of edits - commercials, music videos - no more. I've done a fair bit. But no feature films - 3 hrs long, tonnes of rush clips. For storage I've used normal desktop hard disks which had power supplies, cables, quite a mess. I've just finished editing a feature this way. The smaller 2.5 in. hard disks lacked the capacity and speed to be considered for any feature work. But now, I think I've just found one. I went out and bought a Western Digital WDPassport 250 GB drive. I bought it online on eBay India (formerly baazee.com) for just under Rs 10,000. a bit steep, my friends tell me you can get one on Lamington Road or Nehru Place for under Rs 8,000. Anyway, I bought it online, it was delivered to my home, much simpler than finding parking at Lamington Road and walking in the Sun. Worth the premium. I transferred all the film rushes from my LaCie 500 GB drive to the WD Passport. 183 GB. It took about 3 hrs. So the disk can write sustained at 1GB/min. 17MB/sec sustained write. Pretty good. I opened my film edit project, reconnected to media now on the USB drive. And stitched all the reel sequences together. So I had a sequence of a little over 2 hrs. 24@25, DV-PAL with over 1500 cuts. And all sound was from separately captured clips from a Nagra. And some music and SFX tracks. Video was on one layer except for some dissolves and a very few two-layer supers. All these was playing off media as DV-PAL clips all on the WD Passport 250GB connected via USB and powered via USB as well - a truly portable little drive. I kept the stop playback on dropped frames warning on. And played out the sequence full screen. And let it go. 2 hrs later, the sequence finished playing and had played through without a hitch. An entire film edit. So I have no doubt I can edit on this as well. Because during edit one is playing in bursts. Often playing the same segment over and over again with small changes. 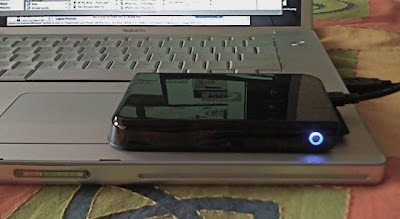 So I think I've finally found a truly portable, USB-powered large capacity but small size hard disk. Capable of being used as main storage for editing an Indian feature film. Caveat is I've only used this for a day. I haven't used it in a really hot place. Subjected it to heat and vibration. And done an real edit with it. But at least it can play our randomly spread out clips in a sustained manner for 2 hrs. If it fails, Western Digital has a great exchange under warranty policy in India. Just go to their web site, enter the drive number, our name and address. And a courier picks it up from your home. After they get it. they ship a new one back to you. More on the drive from Western Digital web site. And a review and comparison with other drives at Tom's hardware. This review on Tom's hardware is about the actual hard disk that goes inside the WDPassport 250 GB. But good enough. And I read the review after buying the drive. Great drive. Does the job. Reasonably priced. But don't buy it for over Rs 8,000.00. Its available in 5 colours. The drive sitting on my MacBook Pro. Its that small. I live and work in Mumbai, India. I do a bit of editing, do consultations on editing, digital intermediates, and general post workflows. And tinker with Mac, PC and Linux systems and all kind of gadgets. to see archives of this blog, and locate information you're looking for.